The 1920’s embody all the glitz and glamour of a bygone era. The world is fresh off the ending of World War I and trying desperately to recover and get back to better days. In Barcelona, war is still on everyone’s lips but this time it’s Civil War. In the city itself, tensions are running high. The rich control the city while the poor suffer and long for reform. Pablo Vilar is a lawyer and journalist in the vibrant city of Barcelona. He is a man whose professions have foraged connections to the criminal underworlds as well as the influential elitist circles and each group hopes to bend Pablo’s pen in the direction of their cause. As a result this book contains a colorful cast of characters—a cabaret artist, a wealthy countess, and a governor that are all tied together in a complex woven tale. Though many try to influence Pablo, he always attempts to remain neutral. But his neutrality is put to the test when Pablo visits the caves beneath the city and witnesses first-hand the conditions of Barcelona’s poorest citizens. The people who call the caves home are tired of seeing their children suffering and in want of life’s basic medical treatments, supplies, and food. These people are at their breaking point. They are ready to bring equality by any means necessary….even by violence. When a vigilant takes matters into their own hands, the city threatens to boil over into an out-right riot. 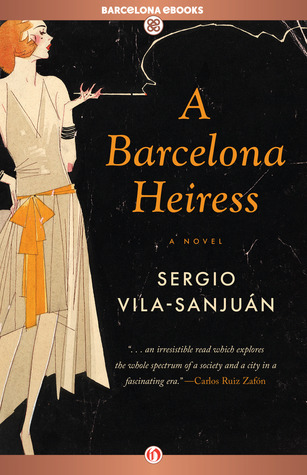 The story alternates between the glitz and glamour of Barcelona’s elite circles and the gritty underbelly of Spanish society and at the heart of this intriguing structure is a mystery. Not just a murder mystery, but a moral mystery. This story asks the reader, “what would you do”? The story lets us unravel the mystery and process the clues but also forces us to explore our own feelings about the nature of the crimes. First of all I would like to thank the people over at NetGalley for providing a copy of this book for me to review. While I enjoyed the elegance of the setting, I struggled with some of the content within the story. My biggest struggle was with the historic references. I am not very familiar with Spanish history or social structure during this era and I thought some of the facts were a little lost on me. There were a lot of references to predominant figures in Spain during this era and I found myself struggling to remember who was who and what their function was. I think I would have appreciated the story more if I had had more of a background in Spanish history. There were a lot of political references which is not really my forte. I thought the story was going to be more of a romance but it was more about morals, mystery, politics, and social structure than romance. Don’t get me wrong, I enjoyed the book and thought it had a lot to offer in the way of history but stylistically, I was looking for something a little more fast-paced. I thought the name dropping bogged things down for me as a reader but yet they are important to the story so it would be hard to do without them. That said, I really liked the setting. I thought the high society and gritty underworld worked well together. That mixture really highlighted the mystery and added a great contrast to the era. I loved anything from this time period so that alone really made this book stand out for me :). I thought Vila-Sanjuan really did a nice job capturing the ‘feel’ of the era and illistrated the tensions happening in the country. Overall, I thought it was a good work of historic fiction and well researched, the author clearly did his research but not quite my style. Interesting! I find there’s a lot of books coming out that are set in the 1920s. Must be the it decade of the moment. Yes! I can’t wait to see that movie.